"Brad's Drink," which he created in pharmacy here, was marketed as Pepsi-Cola after 1898. Around the world, from Prague to Bangkok, the name Pepsi-Cola is known to the masses. The carbonated soft drink’s popularity stems in part from shrewd marketing, driven for decades by the company’s rivalry with its competitor, Coca-Cola. Both products originated in the American South, Coca-Cola in Atlanta, where the corporation is headquartered and visitors are welcomed to a Coke museum, and New Bern, the small eastern North Carolina town where Pepsi originated. Caleb Davis Bradham, born in Chinquapin, North Carolina, in 1867, attended the University of North Carolina for three years beginning in 1886 but completed his education in the College of Pharmacy at the University of Maryland. He then returned to his native state and purchased a drugstore in New Bern. Bradham took particular pleasure in concocting soft drinks for friends gathered around his soda fountain. In the mid 1890s he produced a popular item which he called “Brad’s Drink” and later “Pep-Kola.” The key ingredients were coca leaf and kola nut. In 1898 Bradham changed the name to “Pepsi-Cola” and, in 1902, left the pharmacy to devote full time to the soft drink business. “Pepsi-Cola” was filed as a trademark in September 1902 and registered in 1903. The Pepsi-Cola Company was incorporated in December 1902. Bradham’s friend and New Bern neighbor, pioneering female photographer Bayard Wootten, created the distinctive first logo. Bradham purchased a prominent residence, a historic New Bern house, one that had been used by General Ambrose Burnside, commander of the Union forces occupying New Bern from 1862 to 1865. The business had its ups and downs over the years. By 1910 the company had over 250 bottlers in twenty-four states, making Bradham wealthy. During World War I sugar prices spiked and fell, leading to his bankruptcy. In 1923 he sold the trademark and business to investors in Richmond, Virginia, for $35,000. The company then changed hands four times and went bankrupt again in 1931. Under the new ownership of a candy manufacturer, its fortunes improved and, since that time, Pepsi has become well-known internationally. A trademark dispute with rival Coca-Cola over the rights to the use of the word “cola” was settled in Pepsi’s favor. The two remain intense rivals to this day, from restaurant franchises to sponsorship of major events. Today PepsiCo, headquartered in Purchase, New York, has annual retail sales of over $98 billion and is traded on the New York Stock Exchange. The evolution of PepsiCo is effectively a history of American branding. The company by that name was created in 1965 with the merger of Pepsi-Cola and Frito-Lay, the manufacturer of snack foods (the pairing has the aura of inevitability). In 1998 the company acquired Tropicana, purveyor of orange juice, and in 2001 it added Quaker Oats, moving decidedly into the breakfast arena. Recently the company announced plans to invest over a billion dollars in the burgeoning Chinese market over the next five years. 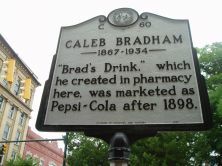 The name of Caleb Bradham and the name of Pepsi are well-remembered in New Bern and in North Carolina. Bradham endowed an annual prize at the pharmacy school at the University of North Carolina. At the height of his acclaim and influence, he had his name mentioned as a potential candidate for governor. He was an active Shriner, bank officer, and a rear admiral in the North Carolina Naval Reserve. When Bradham convened a group of bottlers in New Bern in 1910, he hosted them aboard the Elfrida, a vessel used in the Spanish-American War and refitted as a yacht. Bradham’s drug store at the corner of Middle and Pollock streets burned shortly before his death in 1934. A new building went up on the site soon thereafter. Today that structure is fitted out with plaques and displays dedicated to the history of Pepsi-Cola. 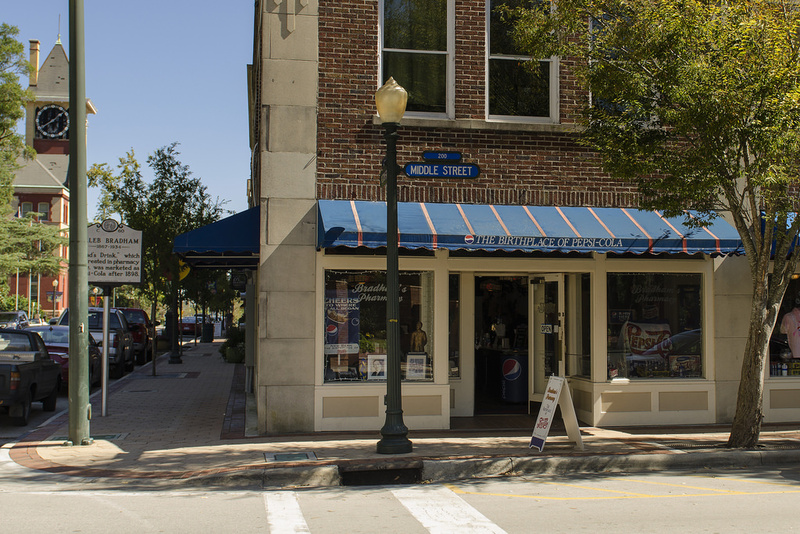 The local bottlers in New Bern, owned by the Minges family, over time have created their own legacy. In recent years regional bottlers marketed Pepsi-Cola under the slogan “Taste Born in the Carolinas.” The commemoration in 1998 in New Bern of the centennial of the beverage included a parade, fireworks, memorabilia shows, and a play based on the life of Bradham. Tryon Palace Historic Sites and Gardens in 2010 will open a new History Education Center which will include a gallery named for and underwritten by Pepsi.